We have Bundles of gifts that tickle the taste buds. Our gift bundles are as diverse as our bacon flavors. Holidays, milestones and just because bacon is so wonderful themes abound. For the hard to please people on your gift list, stop wasting your time and money and buy them something you can be sure that they will use and love! 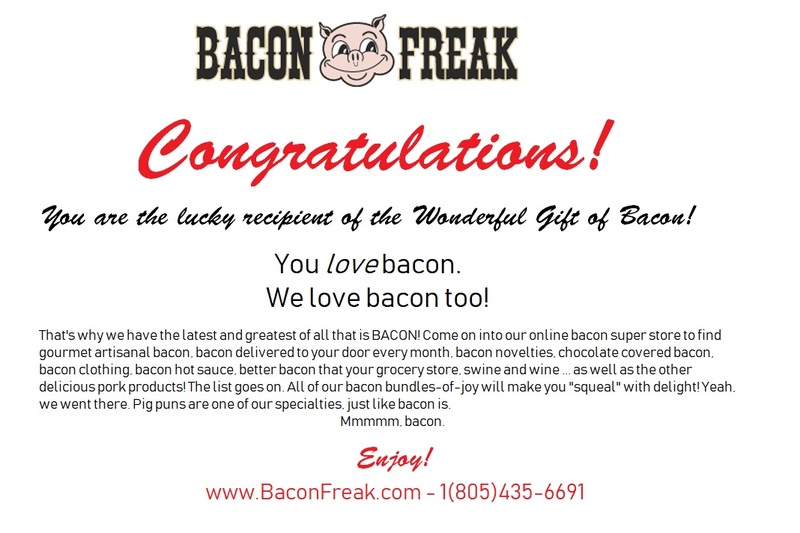 For anyone who loves great bacon, a gift they will love can be found here. T-shirts, totes, coffee, candy, pancakes and syrup, sausage and BACON, salty, succulent, savory scented bacon, are just some of the useful and delicious items you will find in our gift bundles. Our samplers are a great way to choose your favorite flavor, though believe me, it’s not an easy task! From 4-pack bundles to a monstrous 12-pack bundle, we’re sure to have just the right size bundle for your budget. And please come back often as the bundles vary by season or holiday. If you're looking for bundles of just sausage, we have sausage gift sets as well!